A responsive website is the current standard for modern web design and an absolute must have, for website owners. But what is it exactly and what do you need it for? Read on to find out. A responsive website is built with Responsive web design. It displays your website well on all devices - from a desktop or laptop to mobile phone and tablet as it allows you to view desktop web pages on all devices. Device: the device currently showing the page. Screen size: the width of its display. Web browser: the web browser the visitor is using. Based on this, a responsive website automatically adjusts its content. As a result, pages are clear, comprehensible and pleasant to read from any device. What you need it for. For a long time, people viewed websites from desktops or laptops. With the rise of mobile devices - mobile phones and tablets - this has changed. In November 2016, the number of searches from mobile devices exceeded searches from the desktop. Since then, more people prefer to search for information on mobile devices. TIP: In November 2016, Google introduced its Mobile First strategy. 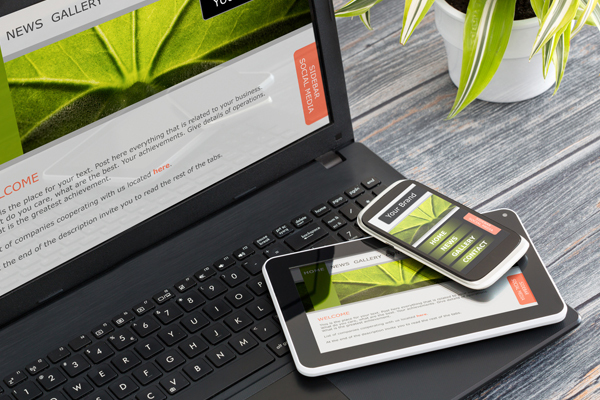 This strategy favours responsive websites in their indexing process. helps web owners put their website ahead of competitors. Websites that lack such requirements will lose web visitors as competitors are only a few clicks away. Mobile Apps. First, develop a mobile app through which people can access your site content. The competition is fierce and only a few people will download your app to their phone. Give lots of added value. In this way, your mobile app will be interesting for your (potential) customers in the long term. Customised Mobile Website. Second, create a new website version customised for mobile devices. An expensive solution that requires lots of work. Instead of one website, you will have to take care of two: a desktop version and a mobile version. Responsive Website. Third, create a responsive website. It flexibly adapts to the device, screen size and web browser which it is being viewed on. Often, this is the best and cheapest option. It involves one sole website. Internet Server Providers offer mobile site builder solutions for sites and e-commerce. TIP: Follow Google's Mobile First Strategy to build a website that displays well on all devices. Start to build it for Mobile (the smallest screen resolution) and continue to build it for Desktop (the largest resolution). If you start with a Desktop version, it might not fit on a small mobile screen.